It seems as if every new week brings in a new generation of the economy. As we now deal with a global economy, there is so many different occurrences on a weekly basis that effects investor sentiment, that it can be hard to keep up with. At any rate, despite inflated energy and food costs, consumers have kept spending into the storm and morale seems high. Quite honestly, I do really know if this a good thing or something we will pay for later, but for now, long stocks are reaping the benefits. Bonds have definitely been the comfort spot for many people during this past downturn, and frankly, the past couple of decades. 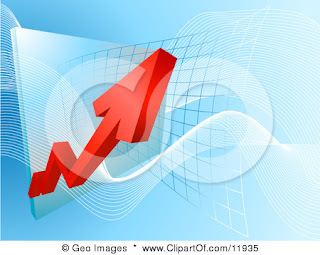 Yields have steadily risen and made many of their investors happy. Thus, there has been a lot of investment taken out of stocks and put into to bonds, which is another reason why we saw such a strong drop in the markets. Well, the appeal for bonds could be changing. With financial markets continuing to look more stable, it is only a matter of time until The Fed begins to hike up interest rates. This will directly effect Bond rates and may cause a bit of a retreat into stocks. If the retreat is severe, expect stocks to get a pretty strong bump. It kind of sounds like an oxymoron, however it carries some weight. There constantly exists an inverse reaction of Institutions and private investors... When one believes things are good, the other is fleeing for the hills. As for me, I like to be on the side of the institutions, as they definitely throw their weight around much more and thus drive the market in a stronger direction. As of late, there has been a lot of negative sentiment with private, individual investors. With this usually comes a more bullish move from larger funds. Don't be surprised to see some large blocks trade within the next few weeks and some violent bumps in key markets. The stall in production that has occurred in Japan due to the earthquake and tsunami has had a global effect on markets, especially the tech industry. Well, latest data shows that indeed Japan has bounced back from recent production stalls and actually is ramping up production and is seeing some pretty strong growth numbers. This translates into a very favorable factor for upward stock movement and is already effecting momentum. The realist side of me continues to look at the economy with fear, knowing that any large amount of bad news could very easily change momentum of this recent strong climb. Markets continue to be in a VERY sensitive state, and thus far, we have been very fortunate not to experience anything too catastrophic that could send consumers back to saving their money (that sounds funny). However, the above influences should continue to drive markets upward for the near future. At any rate, the game plan SEEMS to be working at the moment, when looking at the stock market, but there still remains plenty of problems that need addressing. The stock market is not a true gauge of the actual state of the economy, it is only the perception of stock buyers. As of late, it has been the manipulation game of big banks. My advice, don't put all your eggs in one basket, as it is hard to tell where the money is going at this point. Happy Trading. well it has all taken a massive tumble today, with the euro down, the pound down, the dollar down. Looks like the unstability is here to stay. I have a web site where I give advise on penny stocks and stocks under five dollars. I have many years of experience with these type of stocks. If their is anyone that is interested in these type of stocks you can check out my web site by just clicking my name. I would like to comment about patience when it comes to investing. This could be the most important thing that keeps investors from being successful when it comes to their investments. When companies years ago had defined benifit plans unlike today the primary investment vehicle for those employed is the 401 K their was no emotion involved in the decision making process when their were just defined benifit plans because the plans were managed by a third party the employes had nothing to do with making the investment decisions this was left to usually an investment managment company. paying attention to the market at this point is a schizophrenic passion. In many cases its best not to tender your shares in a stock buyback. It is becoming increasingly obvious around the chanel outlet world that economic or investment analysis can no louis vuitton outlet longer be conducted on a purely domestic basis. The speed with which capital replica handbags is capable of moving means that any economy can be disrupted cartier replica by international capital flows due to external considerations. I was so happy to see best essay tips my most loved bloggers back to posting this week. Don't hesitate to share some you could call your own most loved like in the post.